If left untouched, product slotting degrades over time. SKUs change shipping profiles. Companies add and delete SKUs, and warehouse crews alter the way things are done. Most of the time, we end up shoving items into convenient holes to fix a short-term problem without considering its long-term consequences. Our studies show that a typical warehouse has 50% of its SKUs in the wrong slot. Bad slotting can be responsible for as much as a 20% penalty on order picking productivity. Whether split case or full case picking, you should consider picking multiple orders simultaneously. In doing so, you reduce the total travel required for pickers to complete a day’s work. There are two basic strategies available: group picking or batch and sort. In group picking, each order has its own picking container (e.g., pallet or tote) and the warehouse management system (WMS) directs the picker to the correct picking container based on the order line. In batch and sort, pickers pick the total quantity for a batch of orders, which are then sorted downstream either mechanically (e.g., sortation system) or manually. While picking more than one order at a time increases the risk of picking errors, current WMS functionality goes a long way to mitigating this risk. In instances where batch or group picking is standard operating procedure, your WMS will have the best opportunities to create efficient batches with the largest possible pool of orders. Let orders build in a queue until the very last moment that dispatch times allow. Warehouse management systems generally create work assignments by building a maximum cube for a container, be it a pallet, tote or shipping carton. Orphan order lines happen when part of an order gets cut from a work assignment and placed into a new assignment. Often, these orphans create the same fixed travel for smaller work assignments, which translates into lower order picking productivity. Review the algorithms that create work assignments in your WMS. Is there a tolerance setting that allows you to exceed a cube limit to keep an order complete? If so, make sure it is properly deployed. If not, figure out how often it happens (which is probably more than you’d like) and address the issue at your next WMS user conference. How much of your SKU base is active in a given day or week? For many distribution centers, it can be as little as 50%. A picker might pass a slew of SKUs on the pick line that won’t be active for quite some time. If we could remove those SKUs from the pick line and only face the active ones, the pick line could be dramatically smaller—and more effective. In essence, mini-load systems work on this principle: store an enormous variety and only make available SKUs that are immediately needed. If mini-load systems require more capital than you’d like to spend, try leveraging your WMS to support dynamic slotting whereby only the needs of that day’s active SKUs are replenished on the pick line. In this scenario, there is no dedicated relationship between pick slots and SKUs in that zone. This idea works in split case operations, particularly in direct-to-consumer fulfillment. In analyzing your shipping profiles, you may notice that a small number of SKUs complete a large number of orders. In these instances, it may make sense to set up work cells, or compact areas where pickers can only find the needed SKUs. Depending on volumes, it could make sense to have multiple work cells of the same SKU groupings to achieve higher throughput rates over the course of a shift. At one distribution center, we found that 25% of orders could be completed at the work cells, eliminating all picker travel on those orders as well as congestion from the main pick line. As much as 20% of a picker’s time can be spent during the changeover from one work assignment to the next. Do as much as you can to eliminate this unproductive time. Can work assignments be sent to their picking devices such as RF guns or voice terminals? Can pickers pick in reverse sequence (e.g., travel backward and forwards along the pick line) to eliminate dead travel? Do pickers have ready-access to empty pallets or are they traveling across the dock to a single area of stacked pallets? There are dozens of small changes that can be made to eliminate changeover time. Ergonomics keeps pickers productive in countless ways. Clearly, reducing musculoskeletal injuries means having a full and healthy workforce that calls in sick less often and is more motivated and energetic. But the benefits don’t end there: well-designed ergonomics also makes individual order picking jobs more productive. Every reach that is a little too high or a little too deep adds seconds to every order line. Over the course of a shift or a week, poor ergonomics can lead to as much as a 5% penalty for order picking productivity as well as an increase in error rates. Ergonomic improvement can be accomplished in a number of ways. Some improvements are as complex as retaining an ergonomics expert while others are as simple as adding ergonomic foot mats or adjustable height workstations. Talk to front line pickers about where the difficult picks are, and address those areas. Many distribution center operators don’t have visibility into the labor penalty they pay when a picker arrives at an empty pick slot. The stock chasing activity that follows doesn’t get applied to overall picking performance; however, eliminating these situations should be a top priority in any warehouse. Operators should understand the replenishment parameters available in their WMS and keep them current. Too often, management sets the parameters and only thinks to review them once a small problem becomes a major headache. Half a picker’s shift will be spent traveling the pick line. While most operators know this, not enough take the time to review their pick lines to see if there’s any fat to cut. There often is. Like slotting, the pick line can quickly get out of hand as folks make a series of short-term decisions that turn a once straightforward path into a confusing maze. Correcting the problem is a major undertaking that can take months to implement while keeping business going. It’s also a good idea to look for opportunities to create customer-specific zones that can be skipped unless pickers are preparing orders for that particular customer. There are many other small and big things we can do to improve order picking productivity. 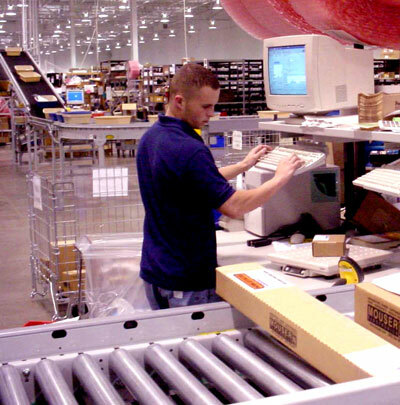 What are some of the initiatives you’ve undertaken in your distribution center? We’d love to hear your comments and share them with other readers! Charles Fallon, Principal at LIDD, has been working as a supply chain consultant since 1998. He has worked with clients at all levels of the supply chain from manufacturers to retailers in a wide array of industries including food, pharmaceuticals, garments and construction materials. He has extensive experience in supply chain strategy and facility design & implementation, as well as operations. Charles holds a degree in mining engineering from McGill University in Montreal.